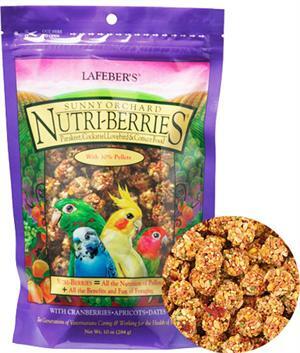 Sunny Orchard Cockatiel Nutri-berries are full of with delicious, inviting flavor. Each nugget provides bite after bite that's jam-packed with sweet apricots, tempting raisins and tangy cranberries. All these tastes work in conjunction with the other wholesome ingredients: safflower, red millet and hulled oats to create Sunny Orchard Nutri-Berries. Brimming with nutrition. Though its play value rivals any treat or snack available, Sunny Orchard Nutri-Berries are, in fact, a 100% nutritionally complete meal.